The Miller family once enjoyed a strong relationship with its accountant, but service declined when his practice was acquired by a larger firm, George Miller recalls. Fortunately for the family’s oil & gas business, the Millers found their way to a new accounting firm, Byler Wolfe Lutsch & Kampfer CPAs, Inc. As a result, they’re back to appreciating responsive accounting service and tax counsel. About William S. Miller Inc. The company was established in 1983 by George’s father, William, primarily as a provider of services to companies that drilled oil and gas wells. Eventually, the company began drilling its own wells, and now manages 120 of them, primarily in Columbiana, Stark and Carroll counties but ranging throughout northeastern Ohio. Miller’s wells reach the Clinton and shallower formations that have produced natural gas in Ohio for decades. The family is not engaged in larger-scale Utica and Marcellus shale drilling, but they do lease some land to deep-well drillers. William is still part of the management team, now as chairman. Others include George’s brother Dave, vice president, and their sister Jane Todd, secretary-treasurer. 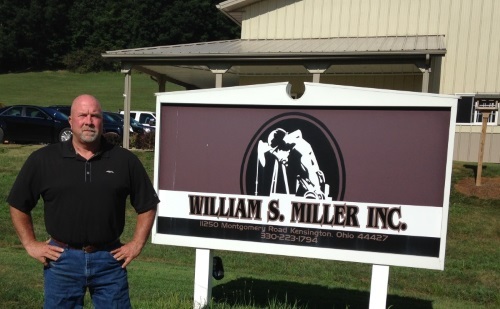 BWLK was referred to the Millers by the administrator of their company retirement plan. “He saw how frustrated we were” with the accounting firm serving the Millers and he knew BWLK principal Gene Byler, George said. One of the best results of the BWLK relationship so far has been the shift of the company from a C corporation to an S corporation, Miller said. BWLK’s Gene Byler worked with the Millers’ lawyer to execute the transaction, which created tax savings and efficiency. The change made sense because of the variety of assets and revenue streams in the business, including equipment, oil and gas assets and royalty income, George said. “The transition put us right where we need to be,” he said. Although revenue in the oil and gas industry suffers when prices are low, the Millers are accustomed to the ups and down of the business. Moreover, they continue to benefit from the transition they made years ago from primarily servicing drilling companies to drilling and managing their own wells. In pricing downturns, drilling dries up and so does service work.